How Are Solar Installer Ratings Calculated? 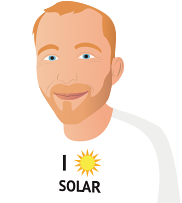 Note: Although SolarQuotes collects reviews of any solar installer in Australia, the ranking tables only show clients of the SolarQuotes network who are actively receiving referrals from us. This means these lists will always be companies that are both actively quoting and pre-vetted by us. To search the entire database, including non-SQ clients, click here. No one seems to agree on a universal method for ranking organisations based on their reviews. A lot of people say "It's easy! Just use their average rating!". If you are a company with 2 reviews, it is a lot easier to have a higher average score than even the best company who has 1,000 reviews. On SolarQuotes, we have hundreds of solar power system installation companies with numbers-of-reviews ranging from 1 to well over 1,000. Here's my method for ranking them. I'm not saying its perfect, but at least you can see how its done. Here we give points for 4 and 5 star reviews and deduct points for 1,2 or 3 star reviews. The idea is that it's no good having tons of reviews if most of them are bad! We then add up the points and the highest score wins. This ranking will favour bigger solar companies that consistently get rated "good" or "fantastic". The company also has to be an active SolarQuotes client to be on the list. 2. "Highest Average Score (Local)"
This is simply the average score of all reviews for all companies with 15 or more reviews. This will tend to favour small, very local solar companies, who consistently get rated 5*. The company also has to be an active SolarQuotes client to be on the list. 3. "Highest Average Score (National)"
This is simply the average score of all reviews for all companies that service at least 3 different Australian states or territories. For the "all" timeframe, at least 100 reviews are required. For the "12 month" timeframe, 50 reviews are required. For the "6 month" timeframe, 25 reviews are required. The company also has to be an active SolarQuotes client to be on the list.